Fire vs Ice slot certainly isn't the first to combine heat with other objects with Betsoft's Fire and Steel and more appropriately WMS's Frozen Inferno, if we want to be more specific to this theme. The reels sit over a futuristic machine and bizarrely the icons seem to be bubbling in a tank of liquid despite their temperature extremes although the classical and calming music should assure us that nothing is going to explode here! The reels stop with a gentle swishing sound but can trigger some loud and dramatic animations should a win appear, so will Fire vs Ice be a case of extremes for our balance too? Our 5 reels have 3 rows each and 25 paying lines with single symbols which are either 'icy' or 'fiery'. There are two Wilds, a Cold and Hot 7 which have a function which we'll read about later, but pay 200x bet for a full line of 5. Fireballs or Diamonds award 64x, Hot Dice or Snowflake 12x, Hot Rose or Icy Bar 8x and Hot Cherries or Snowball 4x and card values are a Hot King or Icy Ace at 2x with finally Hot Jack or Icy Queen at 1.2x bet for the full line. The Wild 7's have two different properties: The Hot 7 will expand into 1, 2 or 3 adjoining positions in any direction randomly to assist your quest for wins, while the Icy 7 always expands to one adjacent position and freezes in place for one more spin. You can land more of either 7 in the spin or can land both types in any spin too. You will have noticed how all those above awards have a Hot or Icy symbol paying the same and this is for a reason - there is a cumulative feature above the reels. You will see a Fire Cannon on the left and an Ice Cannon on the right which have their elements meeting in the middle. Each win of either Fiery or Icy symbols advances the beam towards the other Cannon and if the beam from one reaches the other it is destroyed and a bonus is triggered. If the Fire beam wins you gain 5 free spins with a higher incidence of 7's landing in view. If the Ice beam wins then the Hot Cannon is destroyed and you get a pyramid where you pick ice blocks and progress upwards until you find a blank one. The top block is 50x bet and you should have at least 75x in total if you get to it. If you do, you get a retrigger and start at the bottom again. 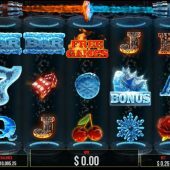 In both cases you might trigger the features above off of the reels with either three or more of the free games scatters or Ice Bonus scatters. Should you do this on the same spin a Cannon is destroyed you get the an automatic retrigger which is a second go at the pyramid or 5 extra free spins. If you get a Hot 7 on reel 5 in the free spins you get extra ones as it has to move one reel left each spin until disappearing so if it arrives say with 2 spins left you will effectively earn another 3 spins although you always start with this 7 on reel 5 so it's rare. You may also retrigger with 3 or more free spin scatters too.